Tending to Surfaces — Ginger writes. This morning I could feel a little clean-up coming on. It began with backdating my last post, since that was written Sunday and should have gone live then. However, there was an internal server problem that hindered the plan, but my trusty webmaster has that all cleaned up now. I needed a clean slate for writing today. But first, I needed to make my bed. I never make my bed, or to be exact, I do it only on the days I wash the sheets, which is maybe once a month. But today I felt like bringing order there. 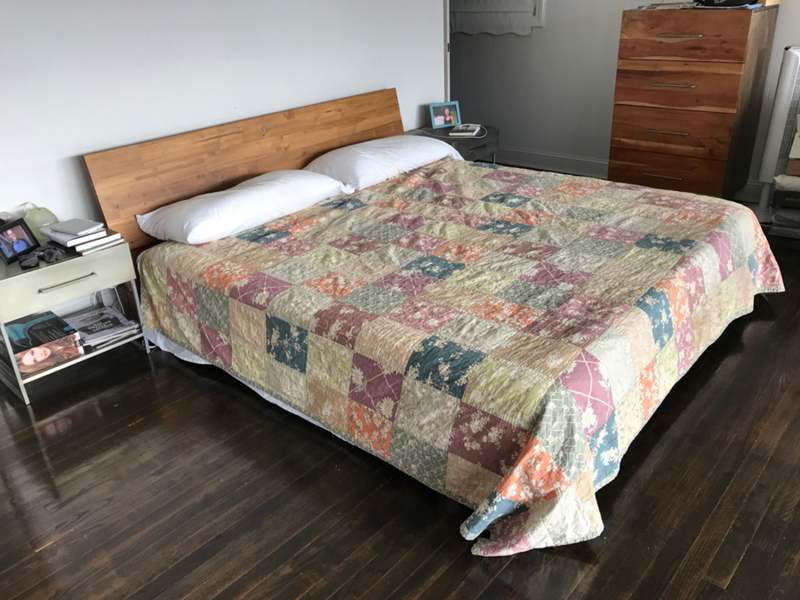 "My mother's bed always looked like Krakatoa, unless I made it, because she didn't have a clue that you could take care of the inside of things, like friends or your own heart, by tending to surfaces: putting on a little moisturizer, say, or making the bed." Then I cleaned out my email in-box. It had creeped to 160 messages, but I pared it down to 44. That was a lot of skimming and deciding, and also a lot of printing. Now, the toner is low and my stack of printed articles is high. 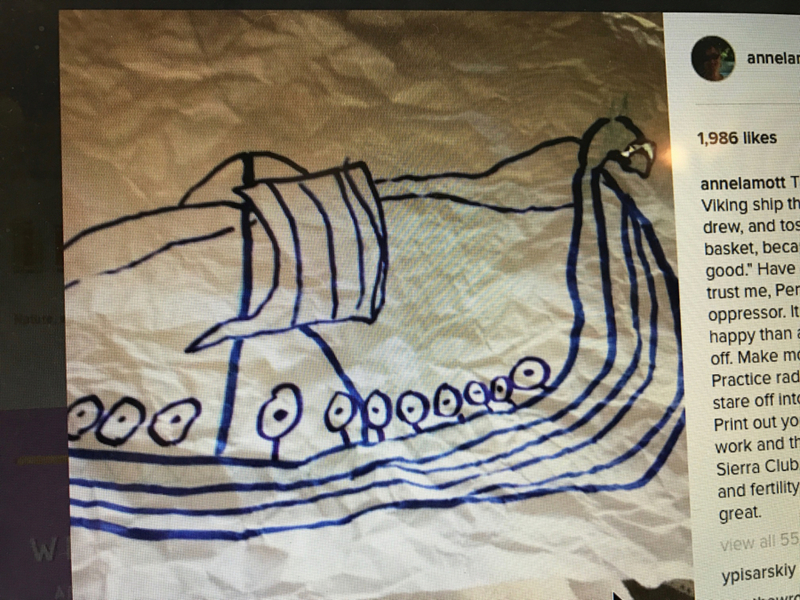 "This is a fantastic drawing of a Viking ship that my 7 year old associate drew, and tossed into the wastepaper basket, because it 'didn't turn out very good.' Have said so many times before but trust me, Perfectionism is the voice of the oppressor. It will make you crazier and less happy than almost anything else. Shake it off. Make more mistakes, more messes. Practice radical silliness. Waste more time - stare off into the middle distance like a cat. Print out your work - overprint out your work and then send some money to the Sierra Club. A messy desk is a sign of hope and fertility. I think you and this drawing are great." I did some difficult relational work last evening and that counts for cleaning out as well. When these conversations come due, as they will do from time to time, I remember a quote but not Anne Lamott's this time. In fact, I don't know who said it, but it's about being sure to say the "final 10%" when working through a problem or concern with another. We can almost always say 90% of what needs to be said without too much resistance. It's that final 10% that is the hardest, yet which usually creates the most breathing room in the relationship and causes the most forward progress. I felt God's provision and grace in the conversation last night and a newness in the relationship this morning. I'll meet with my counselor this afternoon for some additional interior cleanup, whether organizing, disposing of, or scrounging around for the things that are hidden somewhere in my heart. I do, and I don't, look forward to the work ahead of me. But I am taking the counselor's advice not to focus on the cleanup myself before I even get to the meeting. "Today I turn over the waves. I turn over the shore, and the oars, and will sit in the boat quietly with my hands in my lap, as we prepare for whatever is to come." Of course, that's my dear Annie speaking up again, this time from her novel Imperfect Birds. I would like to be an imperfect bird today. A bird so light and free because I made my bed and cleaned out my email, because I did hard relational work last night and will go for more heart work this afternoon. I will throw off the voice of the oppressor, Perfectionism, so I can be a little less crazy today. I will tend to surfaces, yet I will also embrace the messiness. I make my nest, I tend to my babies, I make mistakes, I tend to my heart.